The underground bass music scene is becoming less underground these days, with the “riddim” re-uprising (nod to Caspa & Rusko) and huge festivals like UNTZ devoted solely to grimey, heavy bass music. 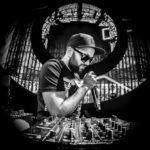 From Philadelphia-based organizers The Kontrol Room, Depth Perception, and Underground Division comes one such festival, which is aptly-named Castaway: A Pirate Massive. 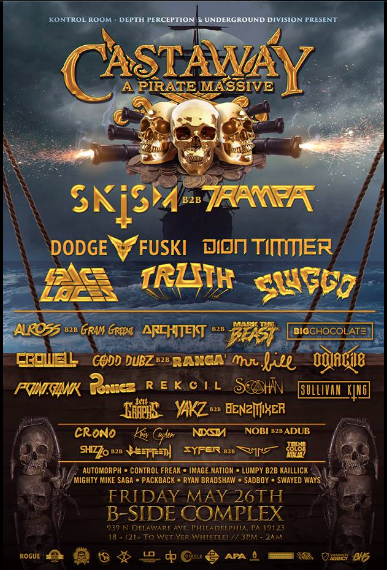 Combing campy with the death metal spirit of dubstep, the one-day pirate-themed event will spread out riddim, drum and bass, dub, and other forms of intelligent bass music across 6 stages. Topping the line-up is Skism b2b Trampa, along with strong headlining support from Dodge & Fuski, Dion Timmer, Spaces Laces, Sluggo, and Truth. The festival will feature back-to-back sets to boot, as well as some exciting names in underground bass, including Mr. Bill, Crowell, Architekt, Crono, and many more. But, underground bass heads need not not lament, underground – bass music’s influx in popularity is no reason to retreat into hipster elitism or shout “riddim is dead” in the streets. The term “commercial” may always seem to be a dirty word, but the fact remains that popularity and visibility are just the ways of trends…and the artists themselves probably don’t mind mainstream exposure. Early Bird tickets are sold out currently. Tier 1 tickets are available now through the event’s website.